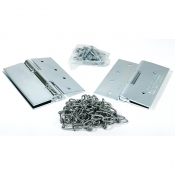 WHY CHOOSE DRIPLOC HINGE KITS? DRIPLOC hinges work and they are one of the most affordable hinge kit on the market. 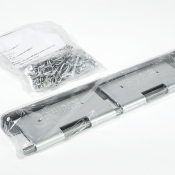 The DRIPLOC Hinge Kit comes with the hinges, chains, and screws to install. One DRIPLOC Hinge Kit will be necessary for each exhaust fan. All DRIPLOC hinges are made of heavy duty steel in order to last for years and to support the weight of most any exhaust fan. And most of all, because of their design, DRIPLOC hinges are the easiest on the market to install. Time equals money. When you order the DRIPLOC Hinge Kit and are not completely satisfied with its performance, send it back and we will refund your money, GUARANTEED! WHY DO YOU NEED EXHAUST FAN HINGES? DRIPLOC Hinge Kits 100% USA Made!! !